The professional education unit of Otterbein University is committed to providing a coherent, developmentally-based teacher education program that prepares teachers to create and work within learning communities which maximize the potential of all learners. The program promotes collaborative learning and critical reflection as a way to develop a community of lifelong learners who can respect diverse perspectives, make informed decisions, and be responsive to the changing needs of children in our society. Effective teachers are knowledgeable and see themselves and their students as lifelong learners. Our graduates will be able to make informed decisions based on complex data. Knowledge is not a series of discrete bits of information. Effective teachers help their students see relationships among different areas of study and their application to the real world. In our curriculum, liberal arts and professional courses are intentionally connected. In the same manner, pedagogy and content often are addressed together. Every child deserves to be taught by quality teachers who believe that each child is capable of learning. 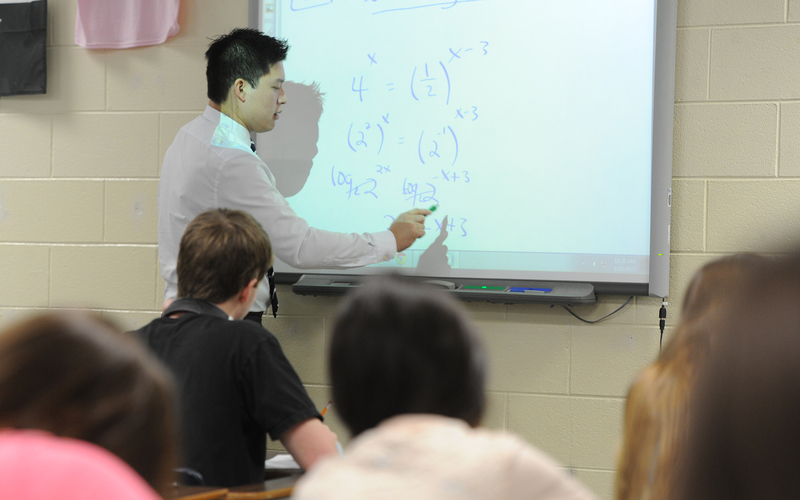 The Otterbein teacher education program provides its candidates with the knowledge, skills and dispositions for creating learning environments that are developmentally responsive for each of the students they teach. Our program prepares teachers to accept, honor and enhance the diversity within the school environment. Diversity includes but is not limited to ethnicity, gender, social class, sexual orientation, and special needs. As teaching and learning become more complex, the effective use of technology within the classroom becomes even more essential. During their teacher education program, Otterbein students will not only use technology as an integral part of their own professional preparation and see technology modeled for classroom productivity, but they will also learn how to use technology effectively in their classroom. The transition from being a student to becoming a teacher requires a great deal of reflection and introspection on the part of teacher education candidates. In order to truly discover their teacher persona, teacher education candidates must take a critical look at what they believe about teaching and learning throughout their program and strive to incorporate those values in their own teaching. Otterbein is committed to continuous and progressive field experiences. The program exposes teacher education candidates to a variety of educational settings. Our program is committed to the formative and summative assessment of the knowledge, dispositions, and skills of teacher education candidates in order to assure that graduates from the program are effective and qualified teachers. Furthermore, the unit will use the information obtained from these assessments to change, alter, and/or modify the program so that the quality is maintained. Prior to full admission to the MAE program, (up to 12 semester hours of graduate coursework), MAE students are advised by the Graduate Education Advisor/MAE in The Graduate School. Upon full admission into the graduate program, MAE students will be assigned a faculty advisor, who will advise them through the completion of their program. MAT students are advised by the Graduate Education Advisor/MAT in The Graduate School until full admission to the program (up to 15 semester hours of graduate course work). Upon admission to the program, students will be assigned a faculty member in the Education Department who will advise them through the completion of their program. Teachers who are enrolled on a non-degree basis are advised by the Graduate Education Advisor in The Graduate School. Academic standing policies apply to all degree, non-degree and workshop participants. For graduate level courses, please refer to the section on Academic Policies in this catalog. For undergraduate level courses, please refer to the Academic Standing Policies in the Undergraduate Course Catalog. For students seeking a masters degree, a minimum grade of C is required in all graduate course work. If a grade lower than a C is earned the course must be repeated and a grade of C or higher must be earned in order to satisfactorily complete the course. A cumulative graduate grade point average of 3.0 or higher is required in order to remain in good standing and to graduate. Please refer to the Academic Standing Policy in the Academic Policies section of this catalog. A student is considered to be in residence when registered for graduate course work offered by or through Otterbein University. MAE students must complete at least 30-33 semester hours of graduate course work (depending on program area) and MAT students must complete at least 34 semester hours of graduate course work offered by or through Otterbein University. Students who wish to change their declared major or program of study should talk with their advisor to explore what this change will mean in relation to required course work. After making the decision to change a major, or program of study, students should contact The Graduate School at 614-823-3210 to request the appropriate form for making the change. The time limit for course work at Otterbein to be applied to the degree is five years. The time limit is computed from the date credit is recorded on the University transcript until the degree requirements are completed. Extension of time requested for adequate and unusual cause beyond the control of the student may be obtained from The Graduate School and submitted to the Education Department’s Director of Graduate Programs. After admission to a graduate program, continuous progress toward completion of the degree is expected. Students not enrolled for one year must submit an updated admission application to The Graduate School. Official college transcripts must be submitted if additional college or university courses were taken during the time of absence. Additional documents may need to be resubmitted depending on the length of the absence. Please contact The Graduate School to verify required materials. Students should be aware that new program requirements may be in effect and are encouraged to contact the program director prior to reenrollment. Students should also be aware that there is a time limit for program completion. Please see the section on Time Limit for Program Completion. A maximum of 10 semester hours of graduate work may be accepted in transfer from other accredited colleges and universities. Transfer work must have been taken within the previous 5 years and must carry a grade of “B” or better. With approval of the Registrars office and/or Education Department’s Director of Graduate Programs, MAT students may count an unlimited number of undergraduate credits toward content area licensure requirements. Transfer work must be listed in the catalog or official documents of the offering institution and must be appropriate for application to the program being followed at Otterbein University. There is no assurance that course work taken at other institutions without prior permission by Otterbein University will be accepted as credit toward a degree. All transfer requests must be submitted to the Director of Graduate Programs in Education for evaluation. The institution offering the work must be accredited and approved for graduate work in education. The content of the course must satisfy a requirement (or be a suitable elective) in a degree program of the offering institution which is similar to an Otterbein program. No more than 10 semester hours of credit earned at another institution will be approved. No more than 4 semester hours of transfer credit may be earned through graduate workshops, (i.e. graded S/U or P/F). Credit will not be recorded until an official transcript or report has been received from the offering institution. Transfer credit must be approved by the Director of Graduate Programs in Education. Only credit transfers, not the grades. Graduate course credit may not be applied to undergraduate total hours.